A London based ServiceMaster Clean company has been involved with the recent clean-up of the damaged Canadian War Memorial in London’s Green Park. ServiceMaster Clean London were contacted last week following the thoughtless act of vandalism that left the memorial covered in white paint. The ServiceMaster Clean company which specialises in disaster restoration services were quick to react and arrived on site just 2 hours after being contacted by the Commonwealth Graves War Commission which maintain the memorial on behalf of the Canadian Embassy. 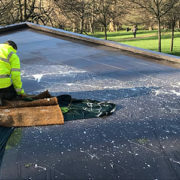 Managing Director of ServiceMaster Clean London Lee Morton, and his team then went on to work on the memorial and were described to do so with “the utmost respect”. Lee ensured only non-astringent eco-friendly products and techniques were used to ensure that no residual damage occurred to the memorial. The team also cordoned off the area for public safety and worked efficiently to ensure the clean-up was completed both quickly and without any further issues. 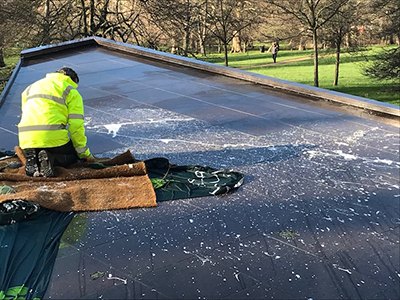 Lee said: “We felt both very honoured and proud to have been called in to clean-up the Canadian War Memorial in Green Park last week. It’s a shame there are people out there that would go to these lengths to try and destroy something that is in place to remember over 58,000 people that tragically lost their lives. “We are just glad we could help, and would like to thank the local community for providing hot drinks to our team for the duration of the work. It was a very thoughtful gesture on such a cold week.” Finished Lee. The site has now been completely cleaned courtesy of ServiceMaster Clean London and our thoughts are with those affected by this senseless attack on a number of important London memorials.